Baby Things I Want: Q&A: Are B-Free trainer cups in Israel the same as BornFree trainer cups in America? Q&A: Are B-Free trainer cups in Israel the same as BornFree trainer cups in America? 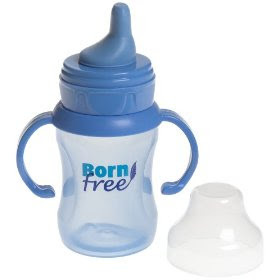 The BornFree and B-Free sippy cups look identical. They both use the same BPA-free plastic, come in the same exact colors, and are the same shape and size. They both use the same white circular insert to prevent spills and enable a nice flow. It is for these reasons that I assumed they were the same product (that B-Free was the European/Asian version of BornFree). So I bought a B-Free trainer cup and Hila won't drink from it. She chews on the spout and gets a little milk out, but then usually throws the bottle across the room without making much progress. So we finally figured out that there IS a difference: The difference is in the SPOUT. The B-Free spouts are harder and less flexible than the BornFree spouts, making them harder to drink from. So here's what I'm thinking (let me know if you have more experience with this): Is it possible that the harder spouted B-Free cups are really the same thing as the BornFree drinking cups (as opposed to the trainer cups, which also look identical)? I've never seen the BornFree drinking cups, but the description says they're the same as the trainer cups but with a hard spout. The B-Free spouts are harder than the BornFree trainer spouts, but they're not "hard" really. They're still made out of flexible rubber. When we go to America (!!!) I'll have to investigate further into this matter. P.S. My sister-in-law Shira (a speech therapist) says that hard spouts are not great for speech development. Rather, you should use flexible, more bottle-like spouts or straws if your baby is not ready to switch to a regular cup.